My work has been featured nationally in several magazines -- including Woodcraft, Fine Woodworking, Arts & Crafts Homes, Cottages and Bungalows, Style 1900, and American Bungalow -- and on ABC's Good Morning America. Locally, I have been featured in Washington Woman magazine and The Washington Times. I have exhibited in several juried shows including the Clifton Day Festival, The Arts and Crafts Conference, the Philadelphia Invitational Furniture Show, and the Fine Furnishings Providence Show. I currently accept Commissions online. I am a past President of the Washington Woodworkers Guild. I have been working with wood most of my life. My passion for wood has evolved from a journey that began in my father’s woodshop, continued through the restoration and remodeling of several homes, and continues today as I build furniture. While there are many influences that affect my furniture designs, the principle influence is the wood itself. George Nakashima, in his book The Soul of a Tree, describes how each piece of wood has a specific purpose that it reveals to the woodworker. This is the philosophy that guides me as I build furniture. I search for wood with a unique character and figure that harmonizes with each part of my furniture. I rarely stain or color the wood, instead preferring to hand-rub an oil finish that allows the woods figure to dominate the design. My construction techniques have evolved to using a blend of modern power tools and traditional hand tools to achieve an efficient balance between time and craftsmanship. Initial milling and dimensioning of stock is done quickly with power tools; while final fitting of joints and preparing surfaces for finishing is done using traditional hand tools such as chisels, hand planes and scrapers. 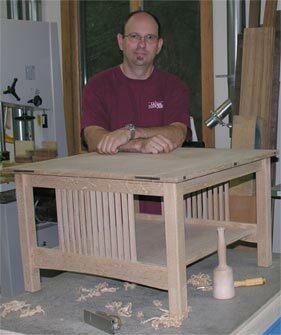 I use traditional joinery, such as mortise and tenon and dovetail joints that have withstood the test of time. Each joint is hand-fitted to ensure a solid, well constructed piece that will last for generations. Where appropriate, I use reversible hide glue to ensure easy reparability. Final surfaces are carefully prepared by hand to ensure an exceptional finish.